The POWERplus Stork is a pocket DAB+/FM Radio with alarm clock function which can be powered by the included external solar cell or by USB. The radio, the solarcell and charging cable is all packed in an EVA material protective transport pouch, so you can easily take your radio with you. Just connect the 1W solar cell with the radio and let the sun charge your radio. The POWERplus Stork has an unique double battery system. It includes a 800 mAh Lithium rechargeable battery, but it also can run on 3 AAA alkaline batteries if needed, for example in case of emergency. 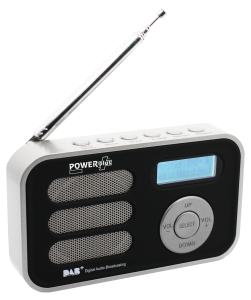 The POWERplus Stork is a high quality DAB+/FM radio with speaker (output 1.2W RMS).